one of ebert’s axiom is that a film is not about what is about but how it’s about it. 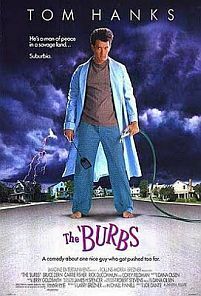 joe dante’s the ‘burbs is a fine example. mining pretty much the same well that hitchcock did in shadow of a doubt and david lynch’s blue velvet(we can leave out the depressing and inadvertently prophetic arlington road), it’s an entertaining addition to the all-is-not-what-it-seems/evil-under-the-suburb genre that is still alive and well. hell, some people make an annoying pretenious career out of it. dante himself has done so before in gremlins and after, in small soldiers. lucky for us, he’s great at mixing his love of horror movies with comedy. one can always count on him to slip a little perversion and messages into a seemingly mainstream popcorn movie. it’s to kill a mockingbird as a dark comedy (except all the characters are white, and without any social messages). the ‘burbs wasn’t a big success in theatres, in fact, it received mostly negative reviews. it may seem hard to believe now but tom hanks was once not a box office guarantee. this came out during his pre-award period: after big, but before a league of their own/philadelphia. the same period that brought us turner and hooch, joe vs the volcano, and the infamous bonfire of the vanities. before every single one of his movies are built as a potential blockbuster and/or award-winner. he is perfect as ray, an uptight suburban family man with a little too much time on his hands. the only other possible actor i can think of who can pull off this kind of normal>paranoid>insane switches is albert brooks. by the way, ray also has the perfect theory about what one’s supposed to do while on vacation. meanwhile, a new family moved into a house in the same cul-de-sac, who are these weird new people? why haven’t anyone seen them? why are they not keeping up their yards? why are there strange noises at night? what’s with the digging in the backyard? surely they must be weird people and therefore hiding something. yes, this is one of those did they or didn’t they movie where every scene gives you just a little information to make you reevaluate what you thought. yet, it’s very seldom that these kind of push/pull thing is this well done. it’s also very very funny. ray probably couldn’t have done much damage by himself. (un)fortunately, his neighbors are there to help. there’s art, the chubby rabble rousing big mouthed neighbor whose wife is out of town. there’s also a gung ho military man who lives with his wife(think john goodman in the big lebowski) named rumsfield(hehehe). there are other people in the neighborhood, mostly old people, wives, and corey feldman, but only the three men are paranoid enough to do any sleuthing. the wives tried the diplomatic route(hmm) while the men were of the action route, while the teenagers watched everything like it’s a movie. hmmmm a conflict involving a somewhat naive main character, a rabble rousing sidekick, and a militaristic rumsfield vs. the diplomatic wives vs. kids watching it all go down as entertainment…i don’t know how audience in the 80s could possibly relate to this. but i digressed, since i first saw and liked the movie in 1990, and these things would not be on the radar for another 12 years. it’s quite impossible to not read these things though, even though they were unintentional, when i watched it again last week. for most of the movie, the plot snowballs carefully with hilarious scenes and red herrings in between. like all mysteries, it wasn’t until the ending that things get a little problematic. in its own comedic logic, it does work to a degree, just not as well as all that happened before. it also feels a little too pat and a bit of a cop out happy ending. but don’t let that stop you from seeking this one out. tom hanks’ not likely to star in things like this again and joe dante’s works have mostly been direct-to-dvd or tv movies. it’s amazing how well a little dark comedy like his holds up two decades later compare to other more popular/prestigious movies of the same period. since it’s on netflix instant stream, matinee may be a good wrap up for spooktoberfest. it was pretty good from what i remember.